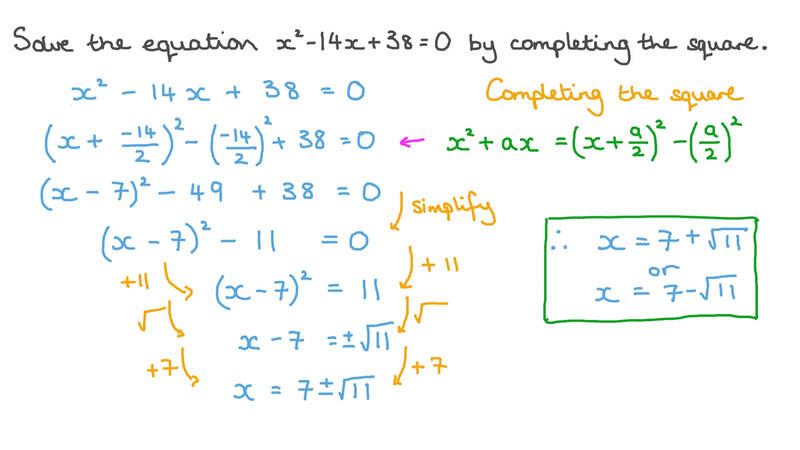 In this lesson, we will learn how to solve quadratics by completing the square and how to complete the square then solve the equation using inverses. Solve the equation 𝑥 − 1 4 𝑥 + 3 8 = 0 2 by completing the square. By completing the square, solve the equation 𝑥 − 2 √ 3 𝑥 + 1 = 0 2 . By completing the square, solve the equation 𝑥 − 𝑥 = 3 4 2 . By completing the square, solve the equation 1 + 𝑥 = 𝑥 2 . By completing the square, solve the equation 𝑥 = 𝑥 + 3 4 2 . 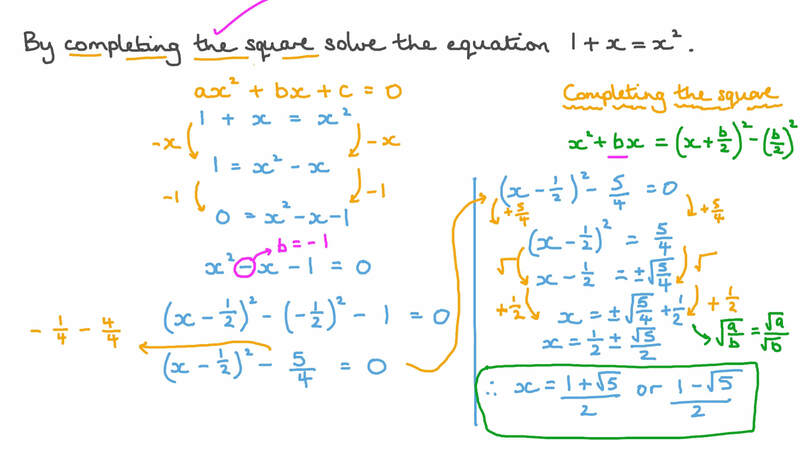 By completing the square, write all of the solutions to 𝑥 − 4 𝑥 + 1 = 0 2 . By completing the square, solve the equation 3 𝑥 − 2 𝑥 = 2 2 . By completing the square, write all of the solutions to 𝑥 + 4 𝑥 + 1 = 0 2 . Solve the equation 𝑥 + 2 2 𝑥 + 1 1 4 = 0 2 by completing the square. Solve the equation 𝑥 − 1 4 𝑥 + 4 4 = 0 2 by completing the square. Solve the equation 𝑥 − 2 0 𝑥 + 7 7 = 0 2 by completing the square. Solve the equation 𝑥 − 4 𝑥 − 1 = 0 2 by completing the square. Solve the equation 𝑥 + 4 𝑥 + 1 = 0 2 by completing the square.